“When Groucho [Marx] went to New York City, he made a point of always visiting his [financial] adviser. “Years after the [Stock Market] crash, the adviser one day asked Groucho if he would like to see the New York Stock Exchange. It turned out that the comic could neither forgive, nor forget. After watching the trading for a few minutes from the visitors’ gallery, Groucho stood up on his chair and began belting out ‘When Irish Eyes Are Smiling’ at the top of lungs. “But Groucho kept going. A guard told him to be quiet or he would call the police. Groucho Marx was free to joke about his experiences during the Stock Market crash of 1929. Despite his losses, he still remained financially secure as the mustachioed, cigar-chomping, quick-witted member of the famous Marx Brothers comedy team. For many other people who played the Market, however, there was little to smile about. 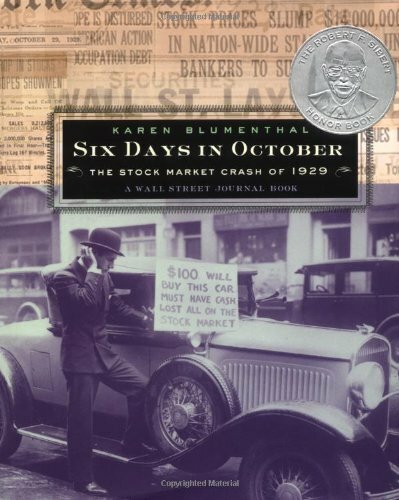 Six Days in October, by Karen Blumenthal, details the week that changed the financial situation of millions of Americans, as well as many people throughout the world. In addition, Blumenthal addresses some of the myths and misunderstandings that came out of the Stock Market Crash.